The man, guarding the entrance to the city at Porta Sant’Anna was approached by a woman walking her dog, who allegedly asked to be allowed through the gate. The guard then refused her entry as she did not have prior permission, which led to a heated debate, culminating in her being sprayed in the eye with pepper spray, Il Messaggero reports. Witnesses quoted by Il Messaggero, who crowded round as the lady began to scream in pain, claim that the woman had merely asked the guard a few questions. About 10 minutes after the incident, a Vatican ambulance arrived and took the woman, along with her dog, into the city to be treated. 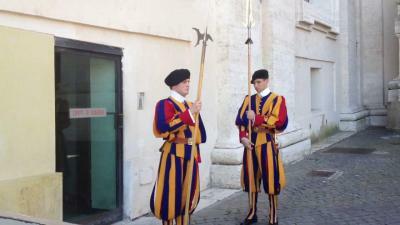 The Swiss Guard involved reportedly declined to comment about the whole event.